Too many times I read people’s websites, people’s brochures, leaflets, or even quotations and most of the sentences start with the word “We”. Yes, go and look at many websites and they will say “Welcome to our thing, we are.” And what everyone does is, they launch in and they introduce themselves. However, to the person who is reading the website, or reading the leaflet or reading the quotation, they want the information they want, they are not interested in you or me, they’re not interested in us, they want what’s in it for them. It’s a simple concept, we are all guilty of it, it’s as simple as that. Now say for instance if I am shopping online, cyber Monday, black Friday, purple Tuesday, who knows what, and I am looking for a particular bargain. Now I may be looking for information on an item or the item itself. I will get down to the point, and I will find the item. I will research it, I will look it up once and findthe information I am looking for. The secondary stage is to check up perhaps on the supplier or the company, so maybe I will go to the “About us” page, maybe I will want to learn who they are and get a feel for them, etc. But up to that point, I’m not interested, it’s irrelevant, it doesn’t matter. And it’s the same with everything; this has been going on for years. So when you talk about yourself or you talk about your product, you’re talking about features of the product. So, say if you were a car company, if you were Lexus, and you talk about everything that the car has got, (I’m going to obviously not give the full features) things like –alloy wheels, climate control, leather seats, electric seats, etc., — these are all features of the car. It’s the same when you are saying, “We are the largest fire safety company in the UK, we have the lowest prices online.” etc. (By the way, I don’t recommend that as a selling point, the lowest prices). But these are features, these are things about your product. What the customer, or the potential customer or the reader wants to know is purely what’s in it for them. So if the Lexus has alloy wheels, so what? What’s in it for them? Why? So what? Who cares? I don’t care, unless you can tell me if it’s got leather seats, tell me, so, why do I need those? Wouldn’t it be cheaper without them? If it has electric seats, and you’ve never had electric seats, what’s in it? Now you’re thinking, that’s obvious. Is it? Why don’t you explain it? Make it obvious, make it a benefit, word it in such a way;. Do you see the difference? Hopefully you do. It’s the same with if you are a major supplier, if you are huge, if you are the biggest fire safety supplier in the UK, you can explain that to the person of what the benefit is to them. So, should there ever be a problem, or should you need back up, should you need maintenance etc, you can rest assured that you are dealing with the largest company with the bigger resources that any other company. We don’t need to give restocking charges and things like that; it’s all sorts of information that can help your case. This applies to brochures, to leaflets, to sales quotes. Quite often by doing it that way, we are trying to hide the information. Sometimes say like prices in quotes, we’ll waffle on on page 1 of trying to further reiterate, trying to put more points down to say why they should buy it and then hide the price on page 2. The customer just wants the price, they’ll flip, perhaps they won’t even read that first page, they will flip to page 2 , where they can see the price; it will stand out because it’s numbers instead of a word. This is the same when reading copy. So on that sales quote, stick the price at the beginning, they’re going to find out in a second. If that price is interesting, they will read the copy and they will go back, they will just scan through until they get to it. Do you see? Do you believe that? It really does happen. We used to do this in our fire alarm world. When we used to install fire alarms, very expensive systems and when we changed it to actually putting the price at the beginning, customers preferred it, they preferred the honesty, it was quite remarkable because no one else was doing it. And we even changed the way we put it as well, we made it really simple, we didn’t try to over complicate it. Customers want what customers want, they’re not the slightest bit interested in you, so leave off the “we are this”, “we are that”. Start with “You”, try the word you, try and rework every sentence that starts with me and try and use the word you. It doesn’t have to start with the word you, just involve you in the sentence, okay? Now if you take your leaflets, your website, all these kind of things, your sales quote template,you can get a writer to restyle them. You can have them done the next time you come up for a reprint or update or anything, and there are places like fiverr.com, upwork.com or freelancer.com where you can pay writers to design them. Ask someone to look at your leaflet, grab the words send it to them, say “We think this is too feature heavy, we want it to be written in benefits style, so it’s of benefit to the reader, using the word you. What’s the harm in that? It could be good. This does work by the way. Anyway, enough of that, you get the gist, just take the “we’s” out of your copy, please, look at them. I’m sure this is going to come up again. Anyway, Thursday today, and that means it is time for a drive time podcast. I like podcasts, you know that, that’s why I am on here. 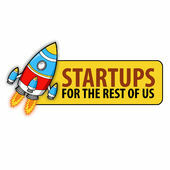 I’m going to mix it up a bit today and I’m going to give you one of the very top listed ones, it’s called “Start-ups For the Rest of Us”, by Rob Walling and Mike Taber. These guys talk very fast by the way, I actually thought I had it sped up, but it wasn’t, they just talk fast. Now the reason I’m saying it’s different and mix it up is because they are in the software world and startups they are talking about startup software companies. However, bear with me, you can learn just as much from a startup software company as you can from others. They have to be nimble, they have to be quick and they have to iterate and the way they do things is very, very clever. Generally they want a startup they need to make a load of money or get bought for load of money by Facebook, Google, etc. so it’s quite a clever thing. There is going to be something applicable to your business no matter what it is. I will give you another example. The book, “The Lean Startup” by Eric Reis, one of my all-time favorite books; I learned to get one of my businesses going, or a division of my business and turned it into £100,000 very very quickly, just from following the principles of that book. So that’s why I listen to things like this Go listen and let me know what you think, I would be interested to hear. If you do ever want to get in touch and ask stuff or tell me stuff, it’s jon@marketingforowners.com; I read every e-mail and I answer every single one. And as fast as I can. Okay, I’ll see you tomorrow. 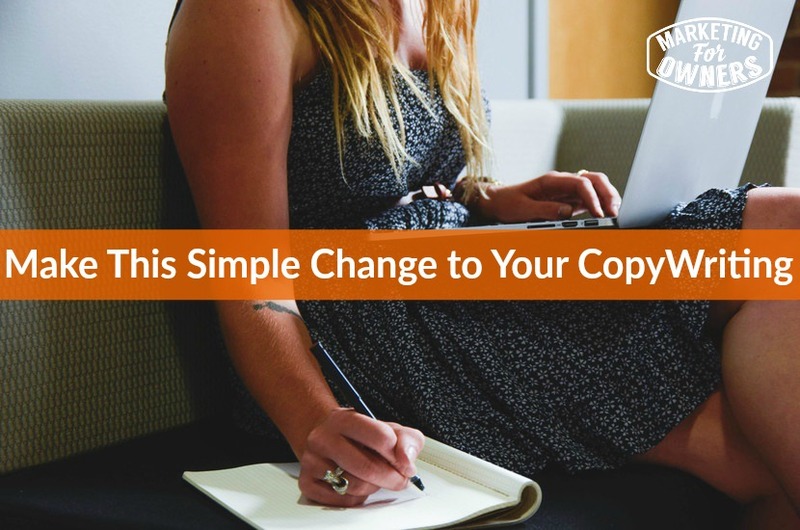 Have you taken the “WE” out of your copywriting yet?